Last week we went to a ballroom dancing class with a blogging friend of ours and her hubby. It was so much FUN! Although Engineer has declared that he will not be attending the class again. He claims it is because he does not want to dance with anyone else's wife. Thanks for trying anyway Engineer. Our Sunday School class decided to do what one of our members coined as "holistic stewardship" and plant a grove of trees. It began as a way for our class to memorialize those people who had passed away in our congregation this year. We then opened it up to anyone who wanted to have us plant a tree in honor or in memorial of someone. We hosted a Whodunnit mystery dinner fundraiser to pay for the project. I love that term "holistic stewardship" we are helping beautify our church property, honoring our fellow congregation members, respecting those who have died, working as a team, making a very visible testimony to God's goodness, and doing something great for the environment. Diva has the week off so I think this is the year where I will be enlisting her help in the Thanksgiving preparations. We will be hosting it here and there will only be 8-10 of us but we never know who might show up. No matter. There will be food. 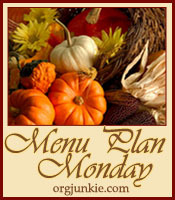 This is part of Menu Plan Monday over at Organizing Junkie. Um, I think I need to hear more about cornbread waffles! Love them! I use Paula Deen's recipe and they have turned out perfectly every time. Here is the link http://www.foodnetwork.com/recipes/paula-deen/cornmeal-waffles-with-spicy-chili-recipe/index.html I hope you like them as much as we do! They freeze well too.